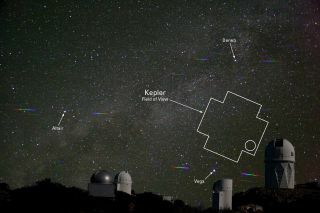 The star field studied by NASA's planet-hunting Kepler space telescope, as seen over southern Arizona's Kitt Peak National Observatory. The approximate position of the alien planet Kepler-21b and its parent star HD 179070 is indicated by the circle. Astronomers have found an alien planet not much bigger than Earth, but so blisteringly hot that life has no shot of gaining a foothold there. The exoplanet, known as Kepler-21b, is just 1.6 times bigger than our home planet, making it a so-called "super Earth." But it orbits so close to its parent star that astronomers estimate its surface temperature to be about 2,960 degrees Fahrenheit (1,627 degrees Celsius) — hot enough to melt iron. Researchers found Kepler-21b using NASA's planet-hunting Kepler space telescope. Kepler spots alien worlds using what's called the "transit method," which looks for telltale dips in a star's brightness caused when a planet crosses in front of the star's face from Kepler's perspective, and blocks some of its light. Astronomers then confirmed Kepler-21b with the help of telescopes at Arizona's Kitt Peak National Observatory. Kepler-21b is located 352 light-years from Earth. Its mass is no more than 10 times that of our home planet, researchers said, but it sits just 3.7 million miles (6 million kilometers) from its host star and takes 2.8 days to complete one orbit. Earth, for comparison, zips around the sun at a distance of 93 million miles (150 million km). Kepler-21b's parent star, known as HD 179070, is 1.3 times more massive than the sun. HD 179070 is a little hotter and brighter than our star, researchers said, and a little younger, too. Astronomers estimate its age at 2.84 billion years, compared to 4.6 billion years for the sun. HD 179070 cannot be seen by the unaided eye, but a small telescope can easily pick it out, researchers said. Since its launch in March 2009, the $600 million Kepler spacecraft has identified 1,235 alien planet candidates. Kepler-21b is just the 26th of these to be confirmed by follow-up observations, but Kepler scientists have estimated that at least 80 percent of the instrument's finds will end up being the real deal. If that turns out to be the case, Kepler's discoveries will more than double the number of known alien planets, which currently stands at about 700. Astronomers think our Milky Way galaxy likely harbors billions of alien planets, though most are so far away that they'll be difficult for us to detect. Researchers report the discovery of Kepler-21b in an upcoming issue of the Astrophysical Journal.